Note: This article was originally published in Other Education, vol. 2, no. 2 (2013), pp. 113-115, and is reprinted under Creative Commons license (BY-SA). 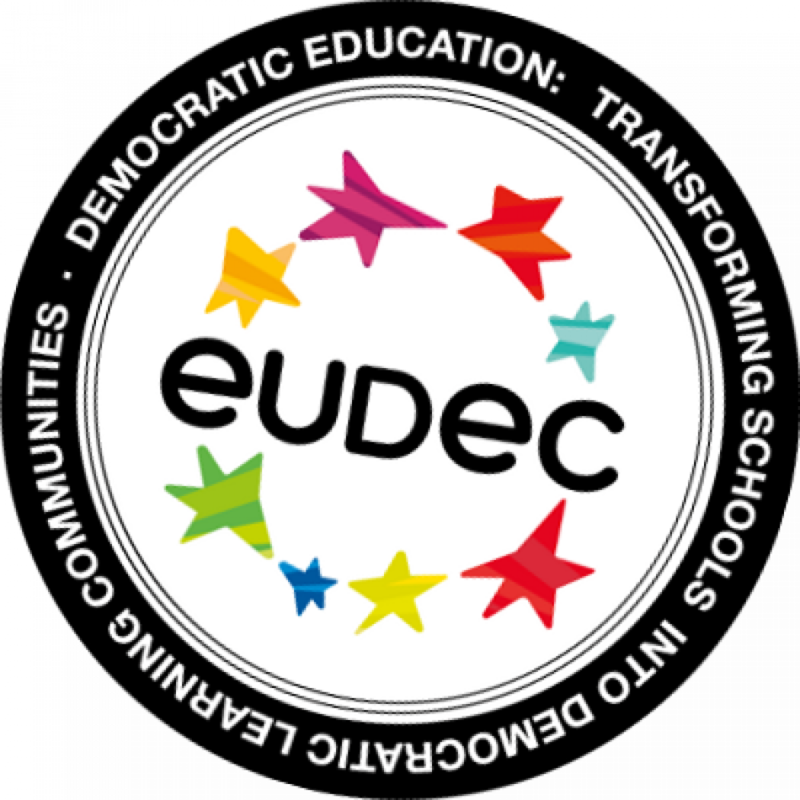 An affiliate of the International Democratic Education Network, EUDEC claims to represent about 58,000 people across 26 countries, including 42 schools, 19 start-up schools, and other member organizations and individuals. The bulk of the conference was organized into an open space, where all participants were invited to organize workshops, including ones that were organized spontaneously according to conversations and needs of participants during the conference. The annual general meeting was limited to voting members, but the final day of the conference was open to an additional 27 public visitors. At the last day, invited scholars, researchers, entrepreneurs, and school founders provided lectures and workshops. Self-determined learning: “Students in democratic schools and universities choose how to spend their school days, pursue their interests and prepare themselves for their lives and chosen careers” (EUDEC, n.d.). A community of equality and mutual respect: “Democratic schools have school meetings in which all members of the community have an equal vote, regardless of age or status. Students and teachers can sit together as equals to discuss and vote on school rules, curricula, projects, the hiring of staff and even budgetary matters” (EUDEC, n.d.). EUDEC member schools have various models and approaches to how democratic education is practiced in their institutions, but many face similar obstacles in gaining the approval of government authorities across Europe, which nearly universally impose structural limitations that ban self-determined learning and disallow students to have an equal voice. The result is that many schools face constant legal battles to stay open, and, in some cases, even parents of the schools are charged as criminals for sending their children there (see esp. Thomas, 2013 for a typical case outline). For the schools that are under siege by authorities, the conference provides a valuable retreat to share experiences, learn from others, and expand networks. The conference theme was “we create the future,” which from my perspective as an education futurist could not be more pertinent. This clashed with a sentiment shared by many of the schools, and particularly the Sudbury-type schools, that their approach to education is “radical.” I strongly disagree. In an era driven by accelerating technological change, globalization, and the emergence of a “knowmadic” society (Moravec, 2013a, 2013b), democratic schools are a necessary option for creating a near-future workforce that is creative, imaginative, and innovative in its application of personal-level knowledge. As the democratic schools movement grows, the shift from their approach from being perceived as radical to a viable option presents new opportunities for research and academic discourse development. From my observations at conference workshops and in conversations with participants, there are tremendous variations in how self-determined and democratic learning is implemented. Deep research into differing practices could yield rich new, vocabulary and dimensions of democratic education that have been largely ignored. In my overall opinion, the EUDEC conference in 2013 deserves high praise for both quality of content and organization. In my informal conversations with participants, however, the conference itself was not the star of the show – but rather the food. Chef Sytse Kramer from HetEten set up a full kitchen outdoors, employed at-risk youth as cooks, and produced restaurant-quality dishes that received near universal acclaim throughout the week. At the closing ceremony of the conference, we had a lot to cheer about, but only the raucous applause for Chef Kramer could be heard over several kilometers away in the center of Soest. John Moravec is a scholar on the future of work and education; a global speaker; editor of the Knowmad Society project; a co-director of the Invisible Learning project; and is an advisor with Education Futures (http://www.educationfutures.com). Moravec, J. W. (2013b). Rethinking human capital development in Knowmad Society. In J. W. Moravec (Ed. ), Knowmad Society (1st ed.). Minneapolis: Education Futures. Thomas, A. (2013). Autonomous and informal education under threat: Summerhill, UK, Sudbury schools in The Netherlands and home education. Other Education, 2(1), 75–77. Time to rethink what, why, and for whom we are educating. The office as we know it is gone. Schools and other learning spaces will follow next.